Okay, so you’ve got the welding moves down. You’re walking the welder’s walk but can you talk the talk? If you aren’t certified the answer may be a disappointing ‘no’ in the eyes of future employers. 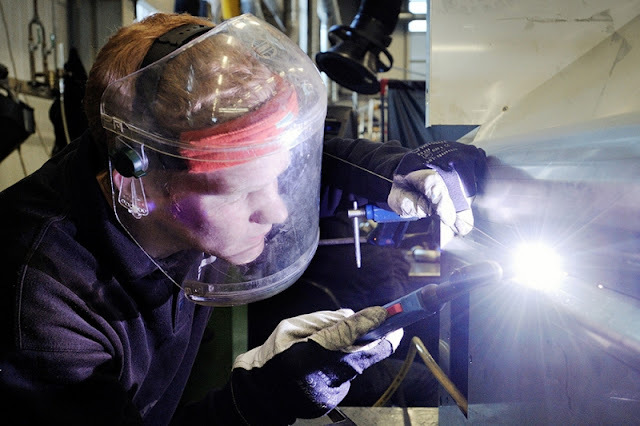 While the world of welding careers is growing in demand, at the same time more and more people are aiming to get those credentials along with the work experience. In the past it may have been enough to have logged countless hours doing even the hardest of tacks and welds, but in today’s market the sad fact is that those little pieces of paper are invaluable to the advancement of your career. But if you aren’t certified, don’t sweat (Save that for the actual testing!) because here you can find the low down on all that you need to know before getting on the road to being a certified welder. Is a piece of paper really worth it? 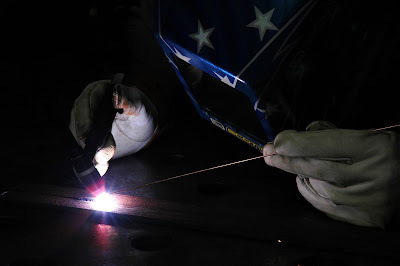 Welding Certification Test – Getting certified as a welder has gotten more and more complex over the years and not only do you need to stay current, but there are so many different types of certifications you can get as well. There is not, sadly, a single test you could pass to prove your expertise in every field of welding. This is because the world of welding careers is so diverse that each niche job is going to require a different specific set of skills. These tests vary between materials, positions, thickness, pipe vs. plate, and so on and so on. So, you need to begin by taking a look at the AWS tests and then select which one is most in line with your own desires. A point you want to keep in mind is that going bigger is not always necessarily better. Don’t automatically take on a test that is going to cover the widest spectrum of job opportunities or qualifications because it may be too much for you and the failure rates of these more complex tests are obviously higher and the amount of time you will need to adequately practice each skill will then be wasted should you fail. Instead, if you start smaller and on a more honed test you could gain certification for that field and then build up your resume from there. They do say slow and steady wins the race. The truth is you may never need all of the skills some of the certification tests entail and why waste your time and energy getting something that won’t get you where you need to be? Instead, save yourself added stress and time practicing useless skills for your line of work and opt to spend it perfecting what you will need. Just like in school where teachers seem to ‘have it out for you’ these certification courses are devised by an AWS committee and they wrack their brains to come up with every possible skill, position, material, or other challenge you may face while welding. That doesn’t necessarily mean all of the things you will be tested on will actually come up in the real world, or even be practical, but in terms of the test itself that is a moot point. So the lesson here is that even if you are amazing at your job you still need to ‘play the game’ and study up and be prepared for what you will face on any certification test. There are practice courses you can take and that is something well worth the investment. What do I need to do to get these credentials? Taking a certification welding test can be done a few different ways. If you take a job with a business that needs their welders to be certified you can go through the testing they provide and the added benefit of this is that they will pick up the tab. They will further pick a test that is in line with what your specific welding job is. Yet if you aren’t going to go that route you will want to contact your nearest AWS testing site (to find one you can go the main AWS website) as long as you make sure it is accredited and will count. From there you will pay to have the test of your choice done; again keep in mind that the more specific the test is the better. It may seem simple but it will ensure your best odds for passing so long as you have adequately practiced and prepared. Once you’ve passed you will then be certified to work under the parameters set and from there you can continue to gain more certifications in other areas to build up your resume. There are plenty of standards and codes that make the entire process even more tricky and that means that if you are certified under one business you have worked for it may not carry over to another. This can be avoided if you did the aforementioned process and went to a testing facility on your own terms and payment. Yet if you instead were certified from under a specific company it may not count for other jobs and purposes; you may have to go through the entire process again upon being hired elsewhere because your new employers are going to be responsible for all of your skills and work and they will more likely than not be inclined to having you retested under their own jurisdiction. That being said, just because you aren’t certified doesn’t mean that you won’t be able to find a job. This is true if you are applying to a company or freelancing; however, the more high profile businesses and higher paying positions are going to want to see these credentials on your resume. Should you be welding for Mom and Pop down the street they may not care any more about you being certified as they would should you know how to birth a cow; but if you intend on expanding your horizons and potential profits you should get certified. It is a complicated process, but nothing worth doing is ever easy, right? What’s the Welding Certification Test Like? What to expect on a welding certification test. Because there are so many different tests there isn’t one simple guide that will give you the golden ticket to ace that test. Yet, when you decide which avenue you are pursuing there are plenty of resources and advice you can take to heart. 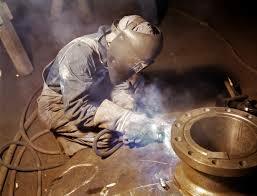 There are plenty of welders who have been right where you are now and have made it to the ‘other side’ so to speak. Along with practice tests you can take, talk to others who have already gained certification and you can find out the basic skills that you will need to get down solid. A common thread among all of the tests is that each one will be subject to both a visual inspection and either an x-ray test or a bend test. What this means is that to the person grading you, they will first look it over to make sure it is sufficient to their standards but then it will also be placed under the scrutiny of the x-ray to pick up anything that may have been missed by the human eye alone. This may sound overly daunting but if you’ve practiced you will be fine as there is a small margin for difference. A final note is that not every test is going to portray the same experience to everyone. Not that testers play favorites per se, but at the same time simple human nature comes into factor and many have reported that should you be taking the test under a company they will place you under a bit more scrutiny. This isn’t because the AWS testing facilities are lax, but because in addition to being a certification test for these companies you are being put through a kind of hiring interview as well. The tests issued by businesses will be most specific to the position you will be granted and they are paying the test shop supervisor to make sure you are up to their company standards. So not only is he under pressure to make sure that anyone passing is in fact amply qualified but it is also on his shoulders whether you pass or fail the test. If you end up passing then perform poorly on the job that isn’t going to look too good on him. It may seem like a lot of hoops to jump through in order to become a ‘certified welder’ but it will open up the doors to uncountable and exciting job opportunists down the road. Thank you for your nice post. The post is very informative and helpful for the others. I got some info from Buyessayonline.com . Welding is very responsible and risky job. People should take care to do it. There will be some, or maybe all of the links on this site or in the post below will be redirected to products on Amazon. Note: Amazon and the Amazon logo are trademarks of Amazon.com, Inc,or it's affiliates. Disclosure: “Welder Referer” is a participant in the Amazon Services LLC Associates and other affiliate program,an affiliate advertising program designed to provide a means for sites to earn advertising fees by advertising and linking to Amazon.com and other program sites.”This means if you click on the link and purchase the item from the advertising,promoting,reviewing and linking page/post to any program sites that related to the products inside of www.welderreferer.com,the owner of this site will receive an affiliate commission, also Amazon and the Amazon logo are trademarks of Amazon.com, Inc,or it’s affiliates. Copyright © 2019 Welder Referer. All rights reserved.